The latest prediction in Harris Jr’s. recruitment is in OSU’s favor. Chris Beard and the Texas Tech Red Raiders returned to Lubbock on Tuesday after a thrilling National Championship game. This bodes well when you’re hosting a recruit like Chris Harris Jr. However it looks like Okahoma State still has a solid chance of landing Harris according to another analyst. 247sports analyst and Texas Tech insider Ben Golan made his crystal ball prediction for Harris Jr. to land at Oklahoma State official on Saturday morning, right in the middle of Harris Jr’s visit. Golan has an accuracy rate of 80.3 percent, according to 247sports.com. Russ Wood also has Harris Jr. going to Oklahoma State. In the grand scheme of things, none of this matters if Harris Jr. doesn’t actually choose Oklahoma State, but a Texas Tech analyst choosing OSU while Harris Jr. is on campus seems like a pretty good indication of what the South Garland product is thinking. 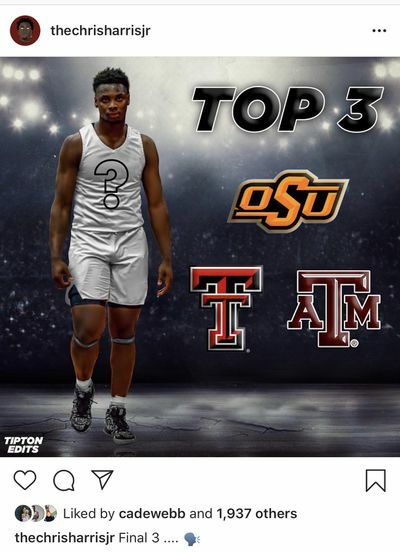 He posted his top-3 this evening and it includes Oklahoma State, Texas Tech and A&M.